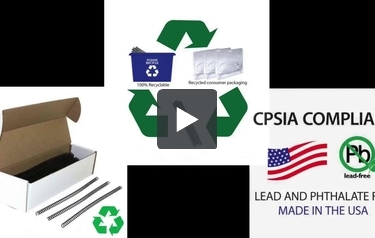 Made in the USA from 96% post - consumer waste. This is MyBinding video. If you’re looking for eco-coil recycled binding coil, we have the guaranteed lowest prices on them. MyBinding.com carries a great selection of environmentally friendly spiral binding coil or eco-coil. Our recycled coil, sometimes called colored coil, EZ coil or spiral comb, is made from more than 96% post-consumer waste, making them recycled and fully recyclable. Additionally, our eco-coil is guaranteed to be CPSIA and ORHS compliant. And these eco-coil supplies can be used with the majority of coil binding equipment on the market. Hey, we’re trying to do our best too. When image matters, MyBinding.